Stream live video and audio of your next meeting, event or lecture to wou.edu/livestream or a specific url address. 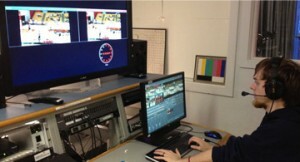 WOU’s Digital Production Services can provide live, multi-camera switched coverage. Events can be recorded and made available for internet viewing and distribution. A good method for extending presentations or events to a larger audience unable to attend onsite. Events can be recorded and made available for on-demand viewing. Live interaction generally provided through Internet chat allowing remotes sites to participate in the event. Event must be hosted in a videoconferencing room, or media equipment must be set up in the origination site to produce the event for distribution.